Give them the gift of light and life with this stunning and inspirational fresh flower bouquet! Simply stylish at every turn, this flower arrangement brings together sunlit yellow roses with the simple and sweet look of white traditional daisies, perfectly accented with green button poms and a winning mix of lush greens. 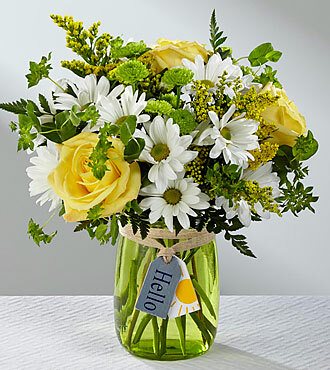 Presented in a green glass vase tied with special tags that read, Hello Sunshine," around the neck, this flower bouquet is ready to create a warm and memorable thank you, thinking of you, or get well gift. STANDARD bouquet is approx. 12H x 11W. PREMIUM bouquet is approx. 14H x 13'W.